Open floor plans create a spacious, airy feeling that appeals to many of today’s homeowners. However, without traditional borders, the living rooms, kitchens, and dining rooms often bleed into one another, resulting in an undefined sprawl. A beautiful and effective solution to this problem is the incorporation of well-placed architectural columns. Correctly used, columns delineate the rooms without disrupting the original architectural intentions. 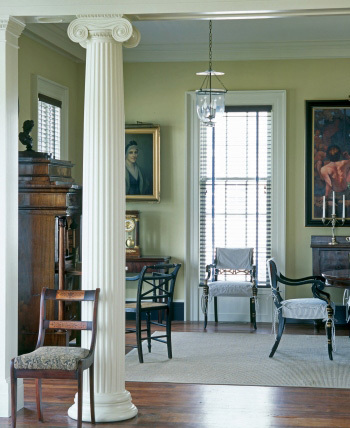 In this home, fluted columns with Greek Erectheum capitals have been used to separate the living room (unseen), a center hall, and the dining room, providing a more contemporary living arrangement in a traditional setting. 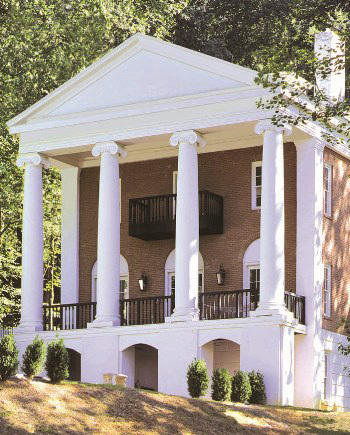 On this Martha Stewart project, a wall was removed, and fluted columns with denticulated Roman Doric capitals and Attic (Ionic) bases were added to expand the space. Here, two sets of Tuscan columns separate the casual living room, a stair landing, and the kitchen, providing visual access to all spaces while still creating a sense of borders. Faux-finished wood columns and pilasters with custom plinths, Attic bases, and Empire with Necking capitals delineate the grand entrance from the formal living area. Octagonal columns and pilasters with Attic bases and denticulated Roman Doric capitals create an open hallway between living areas. 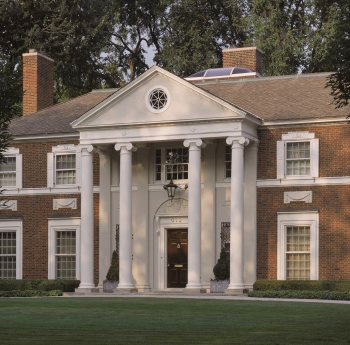 Fluted denticulated Roman Doric columns on custom pedestals demarcate the entrance into different rooms. Columns and pilasters with Attic bases and denticulated Roman Doric capitals provide a perfect, subtle delineation between an entrance hall and the (unseen) living room. Greek Doric columns, with Doric flutes separate the stairway and the foyer. The Ionic Order derives from the Grecians who occupied Ionia, a Greek city-state that neighbored the Greek islands predominately around the middle of the 6th century. The development of this order gave way to more noticeably complex, elaborate, and ornate detailing, which was a clear deviation and evolution of the earlier Doric Order – that was, in essence, more primitive and austere. The most obvious features of the Ionic Order were its more slender proportions as well as the unique volutes, or scrolls, of the capital. Vitruvius correlated the Ionic Order with femininity by linking the column’s slender proportions to the female figure and associating the capital’s scrolls to the curls of a woman’s hair. This connection between column and female figure was also seen in early Egyptian temples honoring female deities, such as the constructed caryatid of the goddess Hathor. It is believed that the first Ionic columns were constructed and represented the Greek goddesses, Hera (island of Samos) and, Artemis (in Ephesus). Although the origins of the Ionic Order are clear, the origins of the Ionic capital – itself – are obscure. Egyptian artwork conveys scroll-like capital details that many have said resemble rams’ horns, shells, or even the scroll pattern of rolled-up papyrus; and many ancient Ionic capitals possess spirals that mimic the curvature of plant life. Some of the earliest Greek Ionic capitals are seen at the temple of Apollo, in Bassae as well as at the Erechtheum, in Athens. Typically, the Ionic Order is exemplified by slender proportions and has a column height between 8 and 9-1/2 diameters, while the column shaft is predominately fluted (24) times around with the flutes being rounded off instead of ending at both the top and bottom of the column shaft. The column shaft terminates downward to an Ionic (or Attic) base that consists of two convex tori (an upper and lower ring) that are divided by a concave section called a scotia. The earliest Attic bases did not have square plinths below the base molding. Flutes at the top of the column shaft are also rounded off before meeting the capital’s echinus that is generally ornamented on the front and back with egg-and-dart detailing above a bead-and-reel molding pattern. The echinus transitions into two, parallel pairs of volutes that are around 2/3 the diameter of the column shaft in height and are topped off by a rectangular abacus, which is greatly smaller than the abacus in the Doric Order; and the abacus is generally enriched with a molded pattern – such as a lamb’s tongue design, for instance – around its rim. Occasionally, in between the top of the column shaft and the bottom of the capital’s echinus featured an extended neck that was adorned with palmette, anthemion, or honeysuckle ornamentation, as seen on the columns at the Erechtheion. Ionic entablatures are approximately 1/5 of the height of the Order as a whole and consist of 3 main parts (bottom to top): the architrave, the frieze, and the cornice. The architrave has three fasciae that overlay on each plane that have little to no decoration. Early Greek entablatures omitted the frieze section, but other examples show friezes that were unadorned and generously fabricated with relief sculptures. Triglyphs were excluded in order to avoid vertical interruption altogether. The uppermost part of the entablature, the cornice, has no mutules but displays rich dentils underneath the ovolo; and the corona and cyma recta molding top off the cornice section of the Ionic entablature – both of which project over the frieze. Overall, the Greek Ionic Order displays more elaborate decoration than seen within the Greek Doric Order – and according to Vitruvius – Greek Ionic columns were representative of female figures all the way from the captials’ volutes (a woman’s hair) to the flutes on the column shaft, which signified the folds of a woman’s dress. 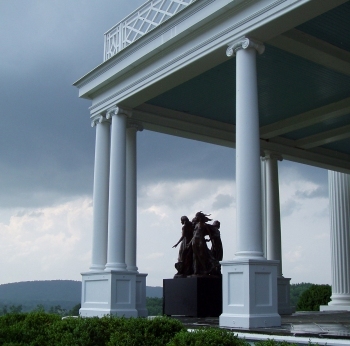 As so, Greek Ionic columns are best utilized for projects that call for elegance and sophistication. As with the Doric Order, the Romans were not unfamiliar with the Greek’s application and elements of the Ionic Order, and they gradually made distinct modifications to several areas in what is considered the framework of the Greek Ionic Order. However – for Roman architecture – the Ionic order was not as favored as the Corinthian Order or the Roman’s very own, Composite Order. One of the notable Roman applications of the Ionic Order is seen at the Temple of Fortuna Virilis. The most obvious features of the Ionic Order, still implemented by Roman architects, were its more slender proportions as well as the unique volutes, or scrolls, of the capital. While the volutes were a universal identifier of the Ionic Order, the Romans created other variations of Ionic capitals. Generally, Roman Ionic capitals seemed smaller than the most familiar Greek counterparts; and whereas a typical Greek Ionic capital had a pair of two parallel volutes, the Romans invented an Ionic capital with four identical sides – each possessing volutes that are equally angled. Another popular practice for Roman Ionic capitals was to position the volutes at all four corners of the capital – giving it a total of (8) volutes. This method was used to avoid the abrupt ending of a column that was situated at the corner of a structure. The 16th century Renaissance architect Vincenzo Scamozzi created a version of this 4-sided capital, known – respectively – as the Scamozzi capital. As mentioned in the History of the Greek Ionic Order, Vitruvius correlated the Ionic Order with femininity by linking the column’s slender proportions to the female figure and associating the capital’s scrolls to the curls of a woman’s hair. This connection between column and female figure was also seen in early Egyptian temples honoring female deities, such as the constructed caryatid of the goddess Hathor. 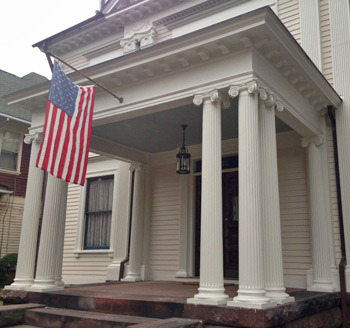 The Roman Ionic Order still showcased columns with leaner proportions that had a height between 8 and 9-1/2 diameters. In some instances, Roman architects reduced the height to 7 diameters, but the previous is what is widely considered standard even today. Greek column shafts were always fluted, but Roman Ionic column shafts could be either fluted or unfluted. The shaft in the Ionic Order as a whole, though, is predominately fluted (24) times around with the flutes being rounded off instead of ending at both the top and bottom of the column shaft. The column shaft terminates downward – with a congé on the shaft – to an Ionic (or Attic) base that consists of two convex tori (an upper and lower ring) that are divided by a concave section called a scotia. Below the slightly larger torus (lower ring), the moldings sat atop a square plinth that was 1/3 the height of the base moldings. In some occasions, the complete column stood on top of a pedestal. Flutes at the top of the column shaft are also rounded off before meeting the capital’s echinus that is generally ornamented on the front and back with egg-and-dart detailing above a bead-and-reel molding pattern. Volutes on capitals that are positioned at an angle extend below the small, ornamented bead-molding. Roman Ionic entablatures frequently dawned ornamentation at every possible location of the entablature, and they are approximately 1/5 of the height of the Order as a whole. The entablature is broken down into 3 main parts (bottom to top): the architrave, the frieze, and the cornice. The architrave has three fasciae that overlay on each plane – the bottom which rested on top of the capital’s abacus. The frieze regularly showcased garlands, putti, and other accents that appeared opulent. At the Thermae of Diocletian, pulvinated friezes were first introduced. Triglyphs were excluded in order to avoid vertical interruption altogether. The uppermost part of the entablature, the cornice, has no mutules but displays rich dentils underneath the ovolo; and the corona and cyma recta molding top off the cornice section of the Ionic entablature – both of which project over the frieze and help support a projecting roof. For the most part, Roman Ionic entablatures were highly decorated to convey a lavish and magnificent lifestyle. Overall, the Roman Ionic Order can be associated with a female figure all the way from the capitals’ volutes (a woman’s hair) to the flutes on the column shaft, which signified the folds of a woman’s dress. Many scholars have also correlated the Ionic Order with both wisdom and grace. As so, Roman Ionic columns are best utilized for projects that call for elegance and sophistication.